Setting up an LAGG interface involves a chicken and egg situation. The network must be up to configure the networking, but reconfiguring it can result in configuration that is incomplete and broken. After the LAGG is configured a reboot is required for it to be created, so that it can be selected in the VLAN configuration. The initial setup was with the first NIC attached to the simple switch port. If anything goes wrong, use the console to select the first NIC ('ix0' with the required IPv4 address). Once everything is reconfigured, replug the NIC into the aggregate ports on the switch. 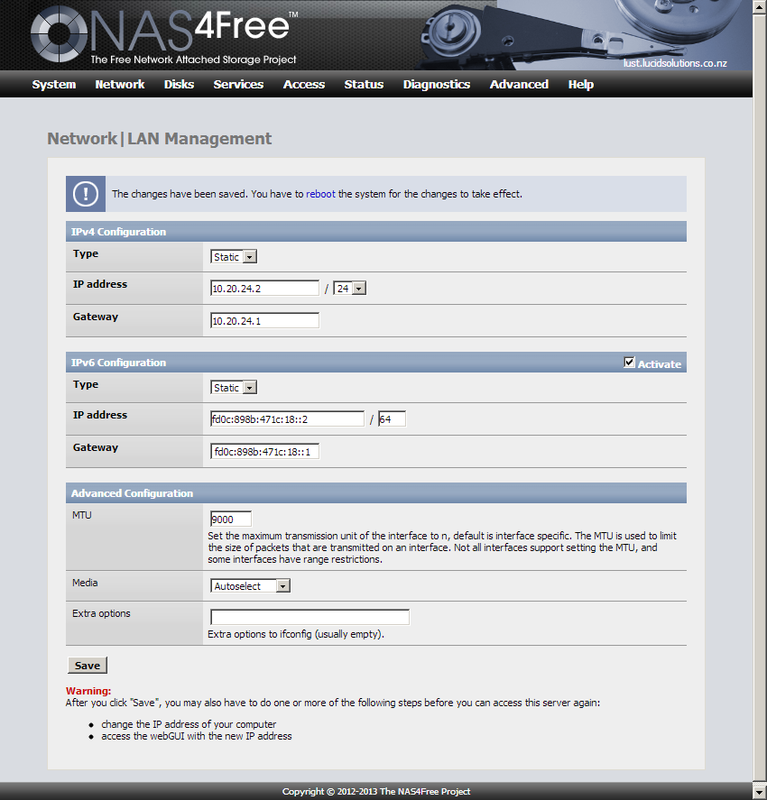 A single VLAN is created for the NAS4Free appliance. 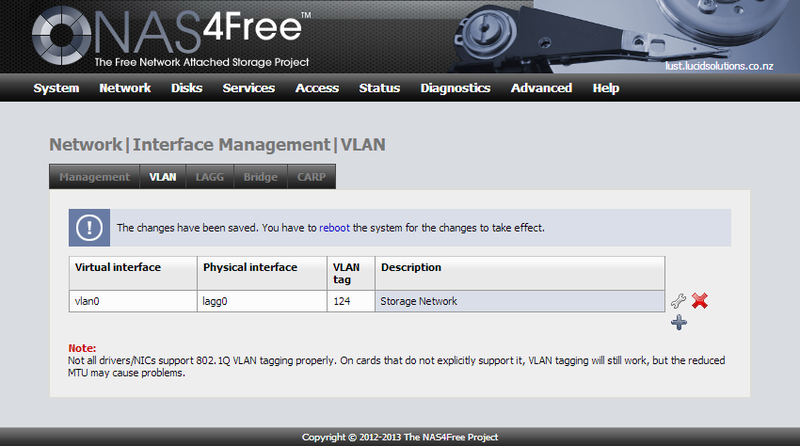 The VLAN is on the LAGG interface. This won't be selectable until after the LAGG interface has been created and a reboot performed. Create the LAGG interface. This will be used for all traffic. 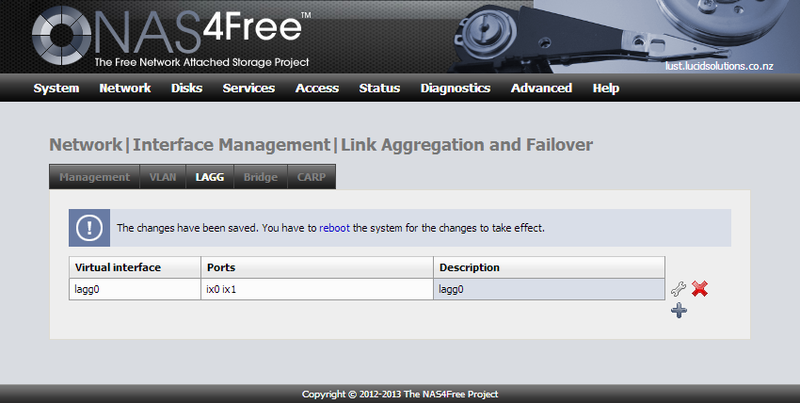 The LAG interface must be activated and an IPv4 address assigned. This configuration doesn't require an IPv4 address so I assigned one that is not routed in this network environment. When the system is rebooted the console will show the first IPv4 address and the first IPv6 address (which is a link local address, not the assigned address).